Summary: Instead of managing different Office 365 services in separate PowerShell console windows, you can connect to all Office 365 services and manage them from single console window. This is not optimal for managing Office 365 because you can't exchange data among those five windows for cross-service management. This topic describes how to use a single instance of Windows PowerShell from which you can manage Office 365, Skype for Business Online, Exchange Online, SharePoint Online, and the Security & Compliance Center. This article currently only contains the commands to connect to the Office 365 Worldwide (+GCC) cloud. Additional notes provide links to articles with information about connecting to the other Office 365 clouds. The Office 365 work or school account that you use for these procedures needs to be a member of an Office 365 admin role. For more information, see About Office 365 admin roles. This a requirement for Office 365 PowerShell, not necessarily for all other Office 365 services. * You need to install the Microsoft .NET Framework 4.5.x and then either the Windows Management Framework 3.0 or the Windows Management Framework 4.0. For more information, see Installing the .NET Framework and Windows Management Framework 3.0 or Windows Management Framework 4.0. You need to use a 64-bit version of Windows because of the requirements for the Skype for Business Online module and one of the Office 365 modules. Windows PowerShell needs to be configured to run signed scripts for Skype for Business Online, Exchange Online, and the Security & Compliance Center. To do this, run the following command in an elevated Windows PowerShell session (a Windows PowerShell window you open by selecting Run as administrator). Here are the steps to connect to all the services in a single PowerShell window. 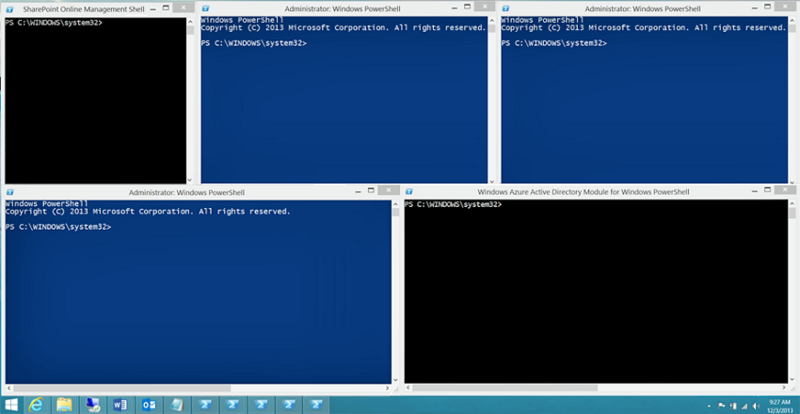 Open Windows PowerShell as an administrator (use Run as administrator). Run this command, and enter your Office 365 work or school account credentials. Run this command to connect to Azure Active Directory (AD) using the Azure Active Directory PowerShell for Graph module. Alternately, if you are using the Microsoft Azure Active Directory Module for Windows PowerShell module, run this command. Run these commands to connect to SharePoint Online. Replace <domainhost> with the actual value for your domain. For example, for "litwareinc.onmicrosoft.com", the <domainhost> value is "litwareinc". Run these commands to connect to Skype for Business Online. A warning about increasing the WSMan NetworkDelayms value is expected the first time you connect and should be ignored. Run these commands to connect to Exchange Online. To connect to Exchange Online for Office 365 clouds other than Worldwide, see Connect to Exchange Online PowerShell. Run these commands to connect to the Security & Compliance Center. To connect to the Security & Compliance Center for Office 365 clouds other than Worldwide, see Connect to Office 365 Security & Compliance Center PowerShell. Here are all the commands in a single block when using the Azure Active Directory PowerShell for Graph module. Specify the name of your domain host, and then run them all at one time. $orgName="<for example, litwareinc for litwareinc.onmicrosoft.com>"
Alternately, here are all the commands in a single block when using the Microsoft Azure Active Directory Module for Windows PowerShell module. Specify the name of your domain host, and then run them all at one time. Here are all the commands in a single block to connect to Azure AD, SharePoint Online, and Skype for Buiness using multi-factor authentication in a single window using the Azure Active Directory PowerShell for Graph module. Specify the user principal name (UPN) name of a user account and your domain host name, and then run them all at one time. $acctName="<UPN of the account, such as belindan@litwareinc.onmicrosoft.com>"
Alternately, here are all the commands when using the Microsoft Azure Active Directory Module for Windows PowerShell module. Note that in both cases, you must connect using separate sessions of the Exchange Online Remote PowerShell Module.